Thanks for reading "This Week in Literary History" but this is the end of the line. The past year has been filled with enlightening and insightful literary stories. Please enjoy the archives. Check out my other on going blog under the mature filter "This Week in Crime History." Why are we captivated with the lives, deaths, and burial places of famous people? Perhaps, it is the lifestyle, or maybe the promise of immortality, which serves as the incentive. Is it that their joys, loves, triumphs, defeats, last moments, and final resting places, all encompass a life we do not have? Ever wonder how and why the classic novels, poems and plays of world literature came about? 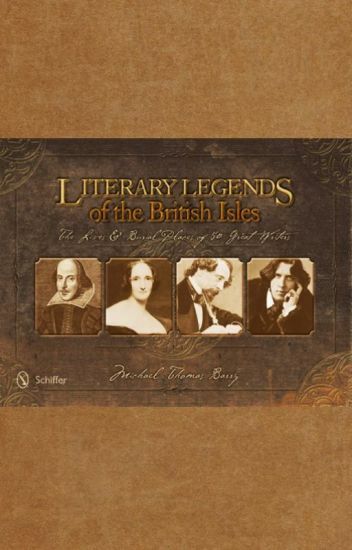 In Michael Thomas Barry’s award  winning Literary Legends of the British Isles and America's Literary Legends, the reader is taken on a journey into the best of English and American literature in concise reviews of the lives of some of the greatest writers and poets in history. Learn how these distinctive individuals helped shape literature from the late-medieval period through the mid-twentieth century. These anthology's take a fresh approach literary history and through brief and engaging biographies the great writers come alive. If you can’t wait and want the whole story. These books can be purchased directly from Schiffer Publishing, Barnes and Noble, Powell's Books, Amazon and other fine book sellers. Visit Michael's website www.michaelthomasbarry.com for more information. Tankas are like haikus but slightly longer, for those with slightly longer attention spans. Syllables go 5-7-5-7-7. Tried to intersperse the serious and the humorous. Originally posted on my blog. All photos used are mine, except when noted. Arianna Ward is forced to move to Swinborn Avenue, into a creepy old house, with creepy rooms, and an especially creepy old attic. Not to mention, this house was all the way on the other side of town, away from her friends. So her mother allows her to invite her friends over to keep her company as she goes camping. The day her friends are scheduled to come over, Arianna finds a game in the basement. But it's not just some board game. It's got cards instead, and each card seems to come true.. But some of these truths seem not be natural or magic, but supernatural, and.. evil. So now, Arianna and her friends are stuck in the house, forced to survive, and only by traveling through.. The Dark Rooms. When Karlin Asinton is whisked off to a world of supernatural beings, she learns she is an elemental and one of the rarest. She finds she is a master to all elements which means she is the only person that defeat the Deviant king and find the lost gods. Karlin will struggle through different challenges as she saves realms and uncovers her past. Amber's life revolves around two things: her grandfather and the Greats, a group of ten highly elite robots who happen to be in charge of her world. But everything changes for her once her grandfather is 'dismissed' and she finds herself alone in the world, destined to serve a robotic family unit until it is her time to be dismissed. Against the rules of society--which state that human slaves are not to read or write-she keeps her rebellious thoughts and ideas in a tiny journal. One day she goes to see her grandfather's grave site, only to discover an enigmatic puzzle left for her. Suddenly she finds herself thrust into the middle of a rebellious organization, and is told she is much more important than she can imagine. With the aid of a quirky cyborg boy, Amber embarks on a life-changing mission to discover that things aren't always as they seem. For new readers: Please read and enjoy; I'd love to hear what you think! For old readers: There have been many edits and plot changes, so you would want to start from Chapter 6 if you have already read the first version. All rights reserved to @RecalcitrantCyborgs, no plagiarism permitted. [Eclipsed Garden: Witches Blood Book 1] It was a place he would always eventually return to, whether he wanted to or not. It was a beautiful cage. The boy looked thoughtful, "I want to go there someday." "I'm afraid that's the one place you can't visit, kid." Jack said, ruffling the boy's hair again. The boy pushed Jack's hand off and straightened his lime green hair. "My name isn't kid. It's Atticus." He snipped. Jack extended his hand. "Jack." Atticus took Jack's hand and shook it, his hand tiny compared to Jack's own. "By the way, why were those assholes chasing you earlier?" Jack asked Atticus. "It's 'cuz I'm cool and they aren't." He answered, being brazen. When Jack raised an eyebrow at him, Atticus carefully put his ice cream bowl down to the side. "Because I can do this." Atticus pinched a strand of his hair. Seconds after, like a wind sweeping across a field, his hair blew from green to an extreme purple. When witches are real and hunted. I will chase our own sanity to the end. Let us catch the truth with our own hands. Linking together our separate souls as one. Atticus, a magical child, enlists the unwilling help of a troubled man into helping him find his missing Aunt Sarah who was taken by a group of bloodthirsty witch hunters who call themselves The Cabal. Joining the forces of other witches, such as Ephraim, Atticus's uncle, and Mallow, the trio search for Sarah while simultaneously trying not getting murdered by The Cabal. However, the man Atticus conscripted is not all who he seems to think he is. What is the identity of the man? Where is Sarah? Will they be able to put aside their differences and save her? A nice neighbourhood called The Playground Street is a nice and peacefull place, with the worlds' most famous playground that is nice so for the youngest kids as it is for the elder people that live there. Until one day everything changes, and the disappearings begin. Kids disappear from the street in the middle of a day, and nobody knows what happened. If physics innovates you, then this certainly has to innovate you too. Victor Marcus is a scientist from Homeworld -a planet inhabited by a technologically advanced society of humanoids. Homeworld is not a very pleasant place. Its society is driven to expand its presence and strength in the galaxy. Duty above everything else is demanded from everyone. Homeworld has become overpopulated with too many distractions. In a world where no one knows who their mother or father or any other relative is, Victor struggles in his efforts to physically and emotionally survive in the challenging environment of -HOMEWORLD. *Soon to be available in print. Trying to escape thoughts of her cheating fiancé, Carly Frost, rare artifact connoisseur and broker misses a connecting flight in Madrid due to a freak blizzard. With every other traveler in the city looking for lodging, she is forced to share a room with a mysterious stranger in a seedy hotel. What antics ensue when Cupid's arrow flies into the mix? And it only appears when it's dark outside. Be very afraid, because it's out there.